Grow local, grow native! Help support biodiversity by growing native plants in your garden. 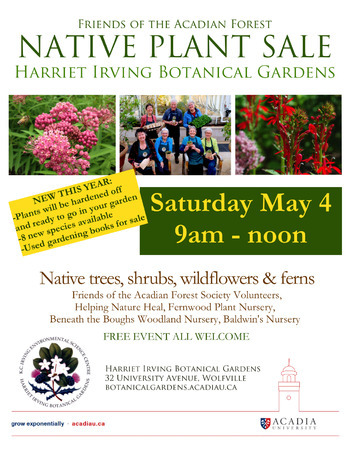 A variety of native perennials grown by volunteers from seed collected at the Harriet Irving Botanical Gardens will be available. We have a wide selection of new species this year and all of our plants will be hardened off and ready to go in your garden! Nurseries in attendance will include Baldwin's Nurseries, Fernwood Plant Nursery & Beneath the Boughs Woodland Plant Nursery and Pottery. Learn more about ecological landscaping by stopping by the Helping Nature Heal booth and put your name in a draw to win a backyard composter from Valley Waste-Resource Management.